Avogadro was born in Turin, Italy, on August 9, 1776. His father pushed him into law, and the study of law, and Avogadro earned a doctorate by the time he was 20. However, Avogadro found the legal profession profoundly boring; it was chemistry, physics, and mathematics that truly captured his interest. He switched to a career in science in 1800 and had become a physics professor at a small college in Turin by 1820. 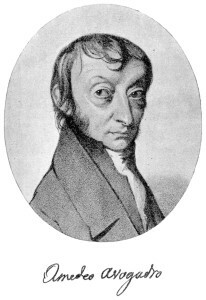 Avogadro’s work focused on understanding the building blocks of elements and compounds. There was great confusion at the tune about the nature of atoms and how they formed different substances. Avogadro proposed the concept (and coined the term) molecule, to indicate the smallest unit of a compound as opposed to an atom, the smallest unit of an element. The distinction between atoms and molecules helped to clarify the function of atoms. Building on the work of JOHN DALTON and JOSEPH GAY­LUSSAC, Avogadro hypothesized that atoms of the same element could bond together. (This had been deemed impossible because of the similar polarities of the two atoms.) Avogadro correctly stated that certain gases could form diatomic molecules, molecules consisting of two atoms of the same element. Avogadro’s work on molecular behavior in gases formed the basis for his most important contribution: he deduced that equivalent volumes of gases at a specified temperature and pressure would contain an equivalent number of molecules, a hypothesis that later became known as Avogadro’s Law. While a brilliant theoretician, Avogadro was weak in laboratory research. Put off by his radical ideas and poor physical evidence, few were willing to listen to his deductions. He published his theory in 1811 in the Journal de Physique, but it was largely ignored and lay dormant for years. Avogadro continued to teach and conduct research in Turin until his death on July 9, 1856. Avogadro made discoveries vital to the understanding of matter, particularly gases. His introduction of the idea of the molecule and his hypothesis about equal volumes of gases containing equal numbers of molecules provided clues about the nature of elements and compounds for later generations of researchers. While Avogadro was unable to prove his theory concerning equivalent volumes of gases, researchers some 50 years later (in 1858), led by Stanislao Cannizzaro, began to confirm and quantify his ideas—in particular, the specific number of molecules in equivalent volumes of gases. This specific number became known as Avogadro’s Number, or Avogadro’s Constant, which is 6.02252 × 1023 molecules per 22.4 liters of pure gas. Cannizzaro championed Avogadro’s work at conferences and in his own writings; he used Avogadro’s work to further his own investigations into the atomic weights of elements in compounds. Cannizzaro established a clear distinction between atomic weight and molecular weight, just as Avogadro established a dear distinction between the atom and the molecule. Other scientists would use Avogadro’s ideas to help further what was known about the elements. Knowing the relative numbers of molecules enabled scientists to determine relative atomic weights. This was influential in DMITRY MENDELEYEV’s design of the periodic table. Avogadro also provided the framework for determining the valences of atoms. Valences helped explain how atoms bonded to one another. Without Avogadro’s grasp of the abstract nature of atoms and molecules, chemists would have continued to be perplexed by the interactions of matter. Posted on March 4, 2015 by Natalie. This entry was posted in Scientists and tagged avogadro's law. Bookmark the permalink.